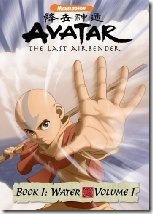 Soon we will know if Aang will defeat the Fire Lord or fall, so I felt that I should make it the first series I would examine in depth. Since it first premiered on February 21, 2005 on Nickelodeon, Avatar: The Last Airbender has been the the only true fantasy show on television. An original fantasy series that does not fall victim to any of the well worn cliches of fantasy fiction or animated television, the show is a brilliant mix of humor and drama with deep character back stories that bring the setting and the characters alive in an entertaining and enriching way. The series begins with sister and brother Katara and Sokka out in a boat fishing. Katara looses her temper and shatters an iceberg to find a frozen pearl containing the Avatar. The symbolism of the chosen one rising from the ocean encased in a blue gem is reminiscent of origin of many of the great gods and heroes of mythology. Aang, who is a trickster hero, is immediately a source of humor and concern. The various bender nations are living examples of the elements they are connected to. The air nomads ride their whims like the air follows the wind. The water tribes all trust their feeling, while the fire nation are driven by their passions. Magic is integral to the setting, and is not only introduced well, but also dictates the technology and manner of living within the various nations. Starting with "The Avatar Returns," they establish the principle that violence is not the solution to every problem. Aang uses every tool at his disposal not to fight. When we see the avatar state for the first time, its power is truly awe inspiring, but at the same time we see the toll it takes on Aang. It is not something he can turn off and on, and the cost for tapping into it is great. None of the kids are masters of their bending. Their vulnerability is clear. In "The Southern Air Temple," we meet the formidable Commander Zhao. He establishes the treat that the fire nation posses to the world, as well as Prince Zuko's position among his own. To enter the air temple, Aang must use his airbending to blow a steady current of air through a labyrinthine series of tubes to blow three horns. Through this simple scene we see the other side of the airbenders. The power of air is not only carefree but controlled and steady. The balance of these two sides of the art are at play in Aang and represent his most basic dilemma. Then when exposed to the horror of what happened to his people, the third element is revealed, that of indiscriminate destruction. The sheer power of the air to destroy everything around it. On Kyoshi Island, Aang learns the hard way that there are consequences for his actions. Even though he is still a child, his birthright forces adult concerns upon him. If only he had been more mature or if he would have listened to Katara, the calamity that ensues could have been prevented. The series begins strongly and only continues to weave tighter stories as if pulls you deeper and deeper into its world. 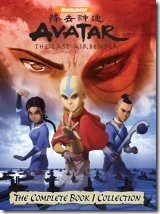 Avatar: The Last Airbender is available at and Amazon.